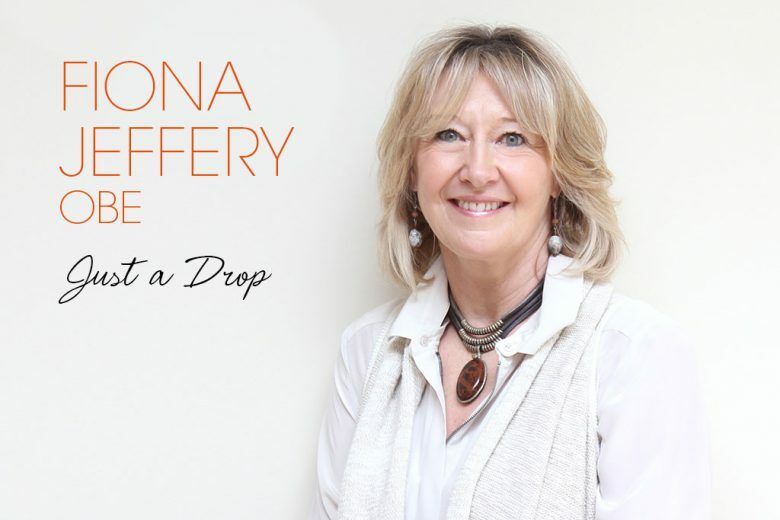 Find out how Fiona Jeffery OBE was inspired to start the charity Just a Drop when she became a mother – and how she’s rallying a Mums Army to transform the lives of less fortunate women and children. After graduating from Edinburgh University with a BA in French and Spanish and MA in Italian, I started in International Retailing. I spent 26 years running international events for the global Travel and Tourism industry and in 2012 I received an OBE for services to the industry. In 1996, I launched World Responsible Tourism Day with the United Nations World Tourism Organisation – and it is now the largest gathering of responsible tourism professionals in the world. I launched international water development charity, Just a Drop, in 1998, whilst running events. Whilst I am the Chair of the Board of Trustees for Just a Drop, I also hold a number of Non-Exec positions and sit on UN World Ethics Committee for Tourism. What was your inspiration to create Just a Drop? The first, most fundamental reason I created Just a Drop was when I became a mum to Cameron and then Lauren. Motherhood made me see things differently. Secondly, in my job I was in a position of influence. Talking to international businesses all over the world, who used the planet as their product, I just felt they should do something to give back. It was a question of working out what. Touched people wherever they were in the world, because I am working in a global industry so it needed to appeal and have a resonance with everyone. Helped children and their families because I had seen the significance of this as a mum. This ultimately together with the 20 second and £1.00 statistics resulted in me focusing on water and sanitation as the core cause. How did you build up Just a Drop and develop it? I started with my own industry and using World Travel Market, the international event I was responsible for, to be its spring board. I created a fundraising initiative and initially worked with the International Red Cross. I developed solutions to help companies achieve Corporate Social Responsibility (although those terms weren’t known or used then), Just a Drop was a very early form of this. I wanted businesses to give back, but I also wanted them to see and get a real sense of where their money was going and the difference it was making. That influenced how I developed the organisation. Projects were identified in the field by villages, schools or health clinics which required critical support. Working with professional volunteer engineers from the Royal Engineers, we built our outstanding Projects Team and Field Officers. What was a significant challenge for you and how did you overcome it? Life is still a challenge but ensuring the sustainability of both our work in the field and the organisation is a primary focus. Working hard to secure funds, delivering effectively in the field and making sure we deliver professionally to all our partners, sponsors and beneficiaries gives focus to the team. When we started we were a purely volunteer organisation and so ensuring people stay motivated, engaged and professional is quite different from a paid for work force and was a learning curve. So the challenge has been evolving, developing and growing in a way that ensures the constant improvement and growth of the organisation. I also have applied business principles to running a charity which has helped us steer through choppy, challenging times, such as the latest economic crisis. I’m a big believer in having as good people as you can afford to have around you or are lucky to have volunteer for you, and I’m fortunate in having both. Just a Drop has operated under the radar for many years and has an outstanding track record. But we recognised that our profile should be expanded. We know the work we do transforms lives, particularly those of women and children. We already have an army of volunteers in our project engineers, so we thought why not, on the fundraising side, develop another army – this time the Mums Army, where mums in the UK could actively mobilise in a way that suited their own personal interests and networks, to help mums in the developing world. If a mum in the UK puts herself in the shoes of a mum in Africa… walking anything up to 12 hours a day in the heat to collect water, which is actually unsafe and will make your children sick, but you have no other choice. You are too busy collecting water to try and have time to do more productive activities, plus you are often in danger not just from sickness but the threat of attack. Mums in the UK couldn’t conceive living like this on a daily basis, yet millions of mums in the developing world do. Just £1.00 delivers clean water to a child for 10 years – so we felt that mums, in whatever way they want to, could fundraise and make a difference, and have fun along the way! What are your top three pieces of advice for anyone who is inspired to start their own charity? Don’t give up in something you believe in. Deliver quality and trust beyond anything else. Be inclusive and embrace others, it’s not all about you. How can women support you and get involved in Mums Army? Mums Army is about uniting mums and women throughout the UK to raise funds and awareness to support mums in developing countries. Get together and hold a coffee morning, sponsored walk or jerry can challenge, there are so many ways! Be creative and have fun. There are lots of fundraising details on the Mums Army website. Don’t hesitate to get in touch – join our group on Facebook and follow us on Twitter. And most importantly, spread the word!